Next time you’re grappling with menu selection you might wish to thumb through the latest bit of government advice on what to eat. It comes from The Scientific Advisory Committee on Nutrition (SACN) and, as it runs to 374 pages, you’re unlikely to have missed it. They’re trying to stop you getting bowel cancer and their advice is don’t eat more than 70 grams a week of red or processed meat. Processing meat means smoking, adding salt or otherwise curing to limit decay. There’s a lot of meat in this report: it tells you not only how much iron you get from different types of food but, perhaps more helpfully, what 70 grams looks like (it’s a lamb chop or two slices of beef). So, as a fact file it’s well worth the price (you can download from the web). There are three potential sources of trouble in these foods. The first is that redness in meat comes from blood, specifically the iron-containing haem group in red blood cells that carries oxygen. When haem is broken down in our gut one product is a chemical group called nitroso compounds (that’s a nitrogen and oxygen atom (–N=O) that can attach to other groups to make a family). The second is that meat’s better eaten cooked than raw and cooking at high temperatures produces substances that can pass from the stomach to the circulation. There’s one report that shows how often you flip your burgers on the grill may affect this factor! The third problem is that suppliers often add chemicals to meats to give colour and flavour and to stop bugs growing. Each of these trouble sources involve chemicals that can damage DNA – that is, either directly or after conversion to something else, they can cause mutations and thus help to promote cancer. The evidence that they can do this in rats is clear but it comes with the rider that, generally, far higher doses than humans would ever consume are required or they cooperate with other tumour-causing chemicals to make them more effective – the rats will get tumours from one treatment: the meat-related chemicals just make them grow faster. So much for rats, what about humans? Over the years a number of large and seemingly well-conducted studies have shown that you’re more likely to get bowel and stomach cancers if you eat lots of red or processed meat. The risk is not huge: the most recent review of the major studies concludes that the relative risk is 1.18 for those with a high haem iron intake – which the authors describe as ‘modest’. Remember that’s an 18% risk increase: a relative risk of 2.0 means your risk is doubled. It should be added that the various bodies responsible for meat production have been quick to point out that there are also large and seemingly well-conducted studies showing no link between meat eating and cancers. Having digested all this, the next time the waiter appears at your elbow, don’t panic! 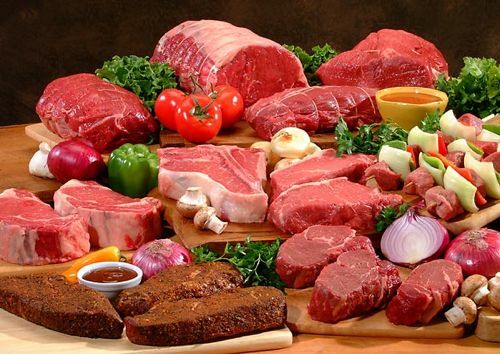 Recall that mankind evolved eating meat because it’s a mighty good source of protein, vitamins and minerals. If the roast beef smells good, crack on and enjoy it!! Yes, it might add fractionally to your risk of getting bowel cancer in years to come. But when you finally stagger out of the restaurant (full but not satiated) remember that crossing the road will contribute fractionally to your risk of being squashed by a truck. Just do everything with your eyes open and don’t over-do anything! Scientific Advisory Committee on Nutrition (SACN) Iron and Health Report – 25th February 2011. Bastide, N.M., Pierre, F.H.F. and Corpet, D.E. (2011). Heme Iron from Meat and Risk of Colorectal Cancer: A Meta-analysis and a Review of the Mechanisms Involved. Cancer Prevention Research 4, 177-184.